Now, I know I don’t live in Chiberia or the frozen tundra of New York, but it got pretty cold here in Dallas the latter part of last week and this weekend! I was grabbing my UGGS and parka every time I left the house… On my way to FlyWheel on Saturday morning, it was 20 degrees out! Since I don’t have any ski trips planned or visits to cold places in the near future, I’m glad I got to pull out these cute and cozy UGG boots I bought a couple years ago. You may remember them from this post in Paris? They’ve been a trusty, warm boot to wear when I’m walking a bunch, and are a touch more elevated than the other classic UGG pair I own. It was such a popular style in fact, that they brought this tall shearling style back this season! 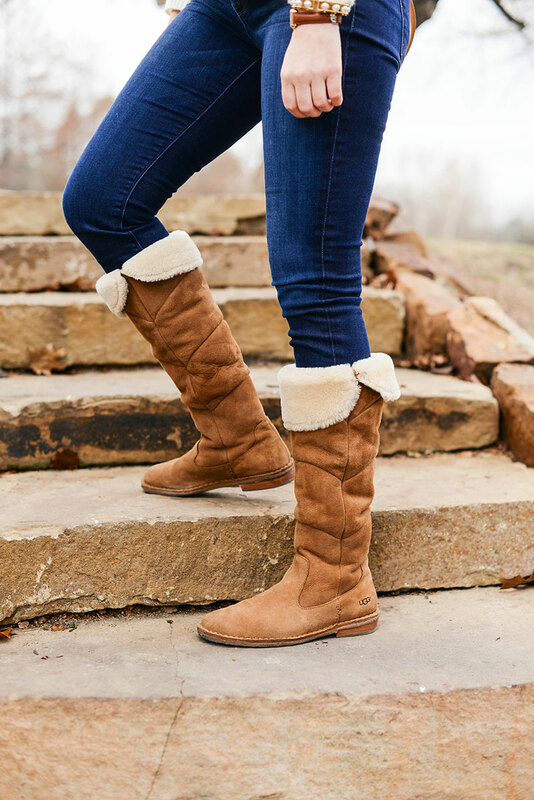 You can style them a few different ways too – the flaps on the front and back go up and down, or you could pull the whole leg down to reveal all the shearling. 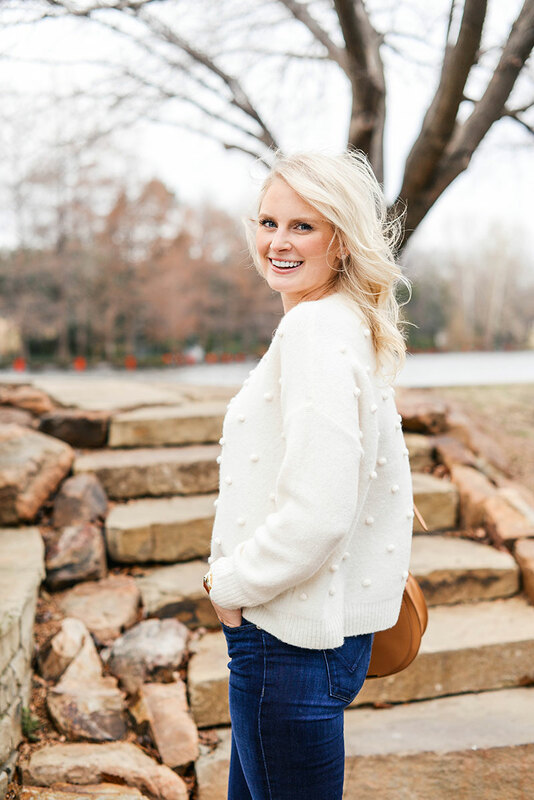 This Kensie sweater looks a lot like the one I’m wearing in this new video I posted over the weekend! Did y’all know UGG made robes?! I didn’t, but I bet this one is out-of-this-world soft. When the weather drops this low, I always reach for my chunkiest knits. Thinking about adding this one and this one to my wardrobe to finish out the season and wear next year! I looked like a total idiot wearing my long parka walking yesterday (it was 40 degrees, but I still felt a little silly). It may make more sense to just get a short puffer jacket to wear when I’m walking/running outside! And in a cute color, no less. Speaking of puffer coats, this one is next on my list. Love the feminine neckline and cinched waist! Get your toes toasty at home with these shearling slippers. Perfect for these chilly mornings! 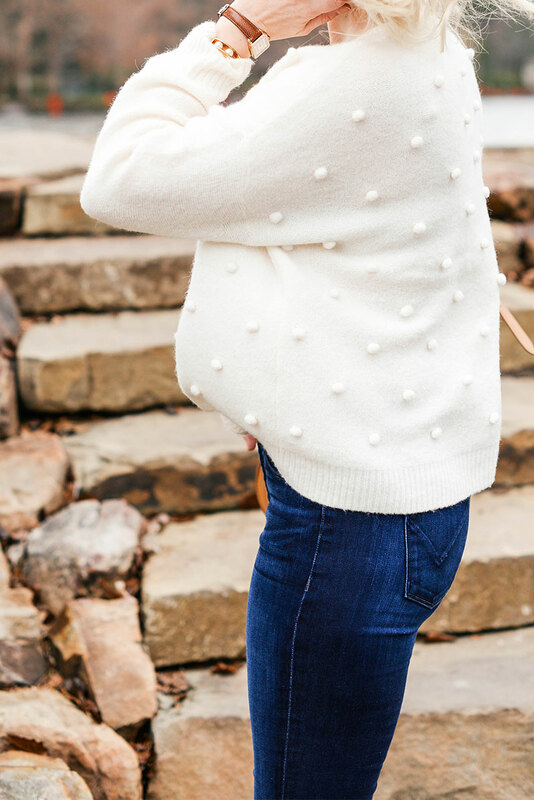 cute and cozy look indeed love this pom pom sweater. You definitely look cozy! I love Ugg boots! Such lifesavers during the cold winter months! Your boots look so warm. Obsessed! What a cute sweater! Your boots look soooo cozy. Merritt ! Those boots look so cozy! Enjoy the cool weather while it last! Cute and cozy is right! Adorable, Merritt. I have a Ugg robe and love it!! It’s so soft and cozy!! Great post! I have a Ugg robe and love it!! It’s so soft and cozy!! Highly recommend! Beautiful post !